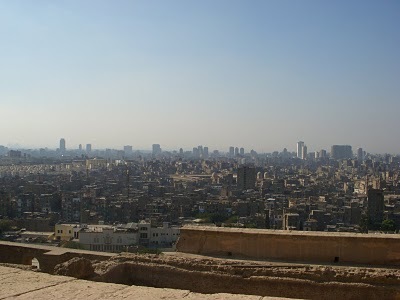 Here are some pictures of Cairo taken from the Citadel. The Citadel, the place I toured today, was the seat of power of Mohammad Aly. Vast incredible structure. The blue mosque in Istanbul is the largest, although it is said that the Mohammad Aly mosque is one of the oldest and it was built in 18 months. Within the area there are many different types of museums. There was a police museum and a military museum within this area. 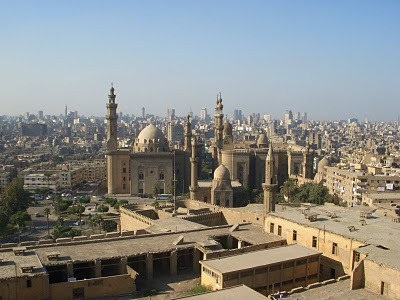 The Citadel provides great shots of Cairo. 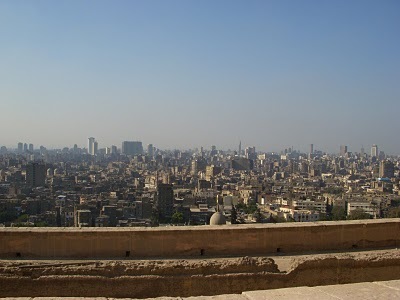 In the picture above the Pyramids are on the very right. 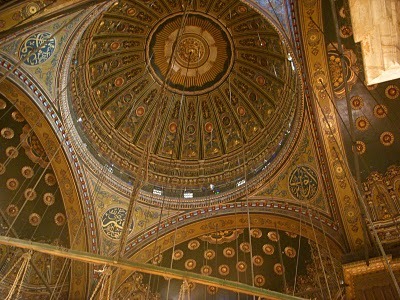 In many ways, Cairo is an amazing city, the largest in Africa. If you enlarge this picture you should be able to see the Pyramids in the background. 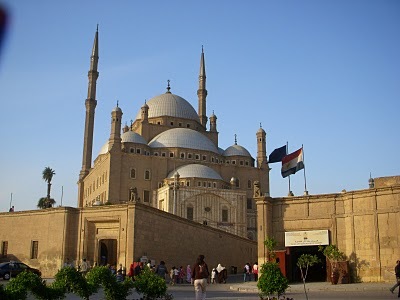 These are two very important mosques in Cairo, just below the Citadel. 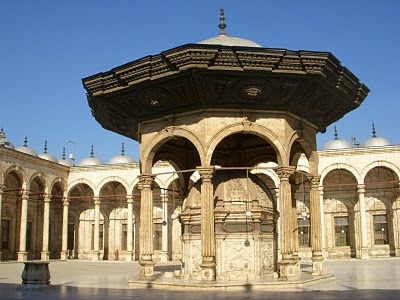 The Muhammad Aly Mosque-The Citadel. After this tourist site I got a taxi ride to downtown for dinner at Gad, which is a local favorite. They have large tables, for the most part you end up sitting with locals. This time three people sat down at the table, which were all work-mates. The twenty three year old gal was beautiful. We had a great conversation. She asked if I was married and asked for my e-mail. Asking if a person is married is a common question out here. I was so surprised that I decided to stay and visit after I was done eating. We had deep eye contact, she was full of smiles and spoke good enough English for us to get by with a conversation. It is quite common for a guy to ask the parents for the hand of their daughter and once they are engaged they can go out together holding hands and all. Although she said many do get married without being in love. She wants to wait and find that one guy who will be in love with her. I agree with that, the only problem is how do you get to that point without being able to hang out before your engaged. It is a complicated type of culture, plus there are many domestic problems within the marriage arrangement because of this way of going about getting married, although domestic marriage problems are common around the world. The bottom line is that this world is complicated. 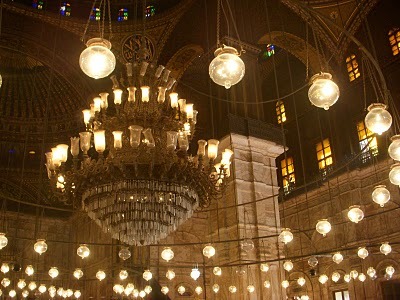 The small amount of time we visited we formed an interesting inner connection which will reside with e-mailing. She was a beautiful girl, we had many laughs within this time. I learned “no problem” in Arabic, they will automatically laugh when you say it, because everyone know “no problem” in English. They also asked what do I think of Egypt and what do people think of Egypt at home. They are aware of the lies the media taunts the public with. The Egyptians are friendly, Egypt is safe. If your wondering about the security? they do have tight security here in Egypt, the police are everywhere. Metal detectors everywhere. I guess the reason a person may think that Egypt is dangerous is because of what has happened in the past, such as in Dahab a couple of years ago. The chance and odds that you-yourself will be in an area that might be targeted is very slim. Fear is the opposite of Faith. Westerns that I run to have this type of fear based perception is a certain way. Propaganda works. It worked in world war two with the Germans, it works today. I don’t believe anyone about any country unless they have traveled that country themselves. By the way I went to the Syrian Embassy. The guy looked at my passport and shook his head and said “no way, an American – never”. The problem is that they were all back from the long holiday, the feast and Christmas, and were quite grumpy about being there. I will try on Monday and if the answer is no, then I will stick to my original plan. 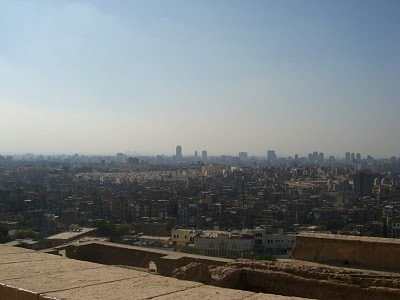 Next post: Update – Cairo.